Our house makeover is progressing well. If our previous house was more of cream and taupe shades, then this house is is not quite fifty shades, but at least five shades of grey – some accent reds and other vibrant colours to add some fun to it. The rooms are progressing little by little, and the master bedroom is currently on the list: wall now have been painted in dove grey with a one darker, graphite-coloured accent walls. 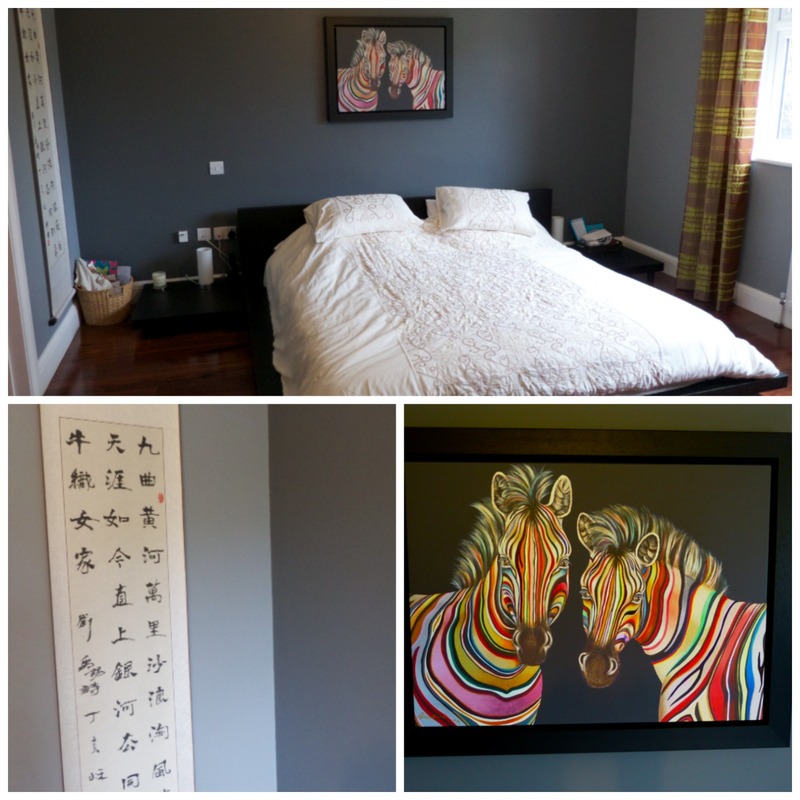 As the furniture is black, the black-framed colourful zebra painting fits perfectly in the scene along with the Chinese poem that I bought in the Forbidden City last year. The inspiration I am looking for today is for updating the mainly cream and gold linens to new crispy white with some grey in it, as well as a new bedspread or throw in grey. I’ve had a graphite electric blind already installed, and now the curtains will need to be updated in a matching colour scheme also. A new black and chrome ceiling pendant is already on its way. 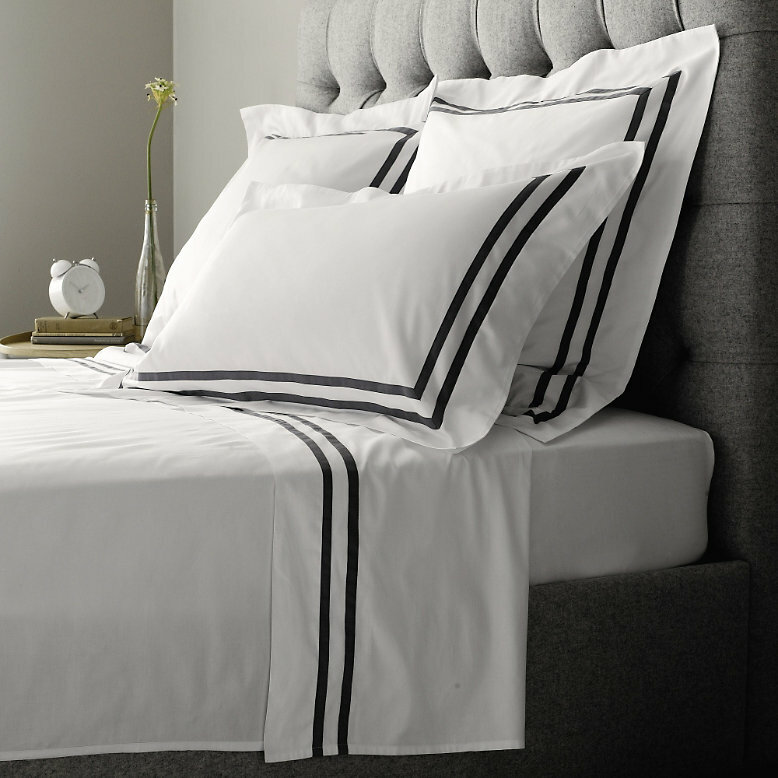 One of my all-time favourites for bed linens is The White Company, which originally was all about linens but now have furniture, clothing and all sort of lovely accessories to go with it. I would like to get that boutique hotel feel and this kind of 300-count Egyptian cotton crisp while linen with charcoal grey double piping would be perfect. This set is from The White Company Charlton linen collection in Shadow colour. My first throw option would be The White Company Luxury Faux Fur Throw in Silver. It would be a more casual and cozy look, but oh so soft and inviting…and the price is very reasonable too at £100. The series also have two sizes of super-soft cushions too. 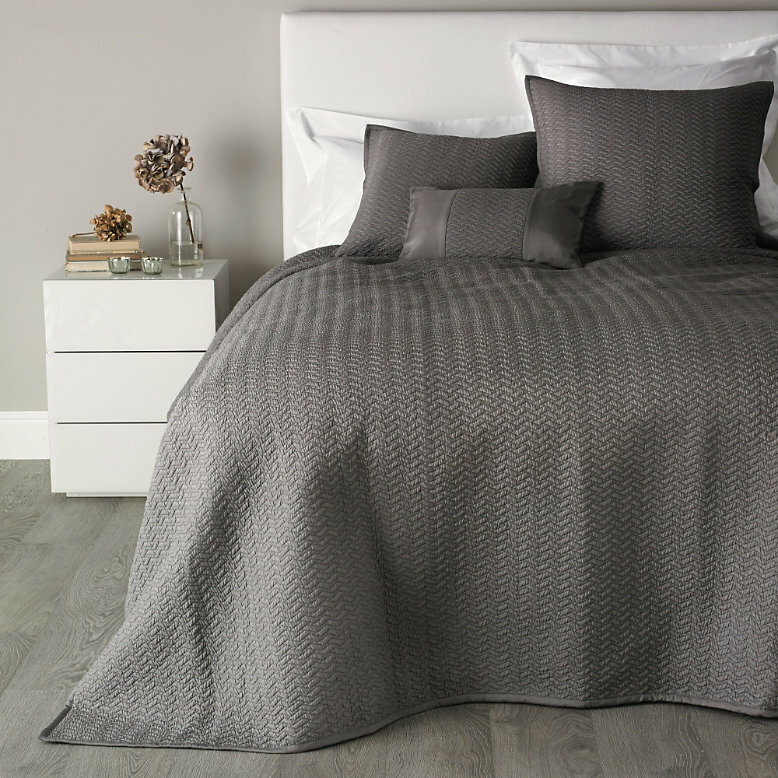 The White Company Hampton Quilt in Heather has a lovely contemporary design with a zig zag pattern. The texture would be lovely as it’s made of silk, with a matt finish, and the bound silk border is gives a lovely-looking finishing detail to it. I like the bit darker shade of this quilt also, and the cushions that belong to this set: this would definitely have the luxury hotel look and feel! My third option would be the The White Company’s Westwick Throw in Silver Grey. It’s more a middle of the road options both in terms of colour and style: casual, medium-grey in twisted cable knit and a plain knitted border. It is made of lambswool, so I would image it would still feel warm and soft, but not quite like silk or faux fur. 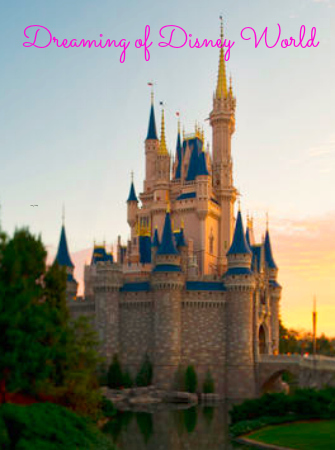 Now, the selection process is getting harder and harder: as much as I like shopping over the Internet, I just might just have to pop into the nearest store and compare the shades and softness of the actual fabrics. While I am pondering which one to choose I am off to look for some fabulous fabrics for the curtains, and who knows what lovely accessories one might spot here are there…I’ll keep you up to date on how this room progresses! I would also be interested in hearing what do you think about these throws and what do you think would fit best with the new colours of the room? One Response to "linen inspirations for the master bedroom in grey"
lovely color palette here… very cozy yet modern. i’m a fan of the zen yet hotel elegance.